4th Annual Chilehead Secret Santa – I Love It Spicy! In the spirit of giving, I present you the Chilehead version of Secret Santa. 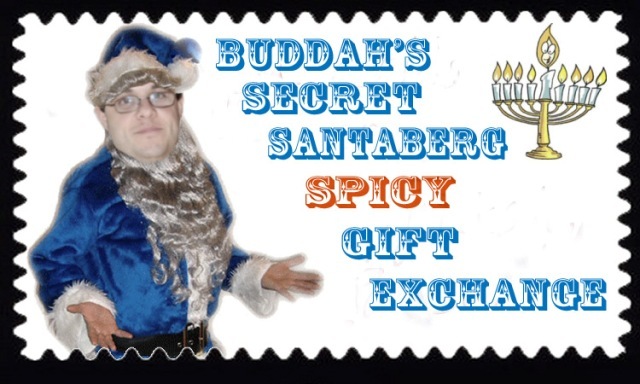 It is a holiday spicy gift exchange between people in our Facebook group: Chileheads. Well, since the group is now teetering on 3,500 people, I have to put a cap on it. Last month I created a 2nd group called Chileheads 2. It was meant to weed out all the pepper pics and the endless reviews and keep it more about the community that revels in spicy product making, great fiery recipes and festivals that people love to attend. Since this is a new group, I am posting the Secret Santa there for people to see. This will keep the # of people relatively controllable for me to handle. Otherwise, Secret Santaberg might need more lil’ helpers. If you wish to be a part of this, then I ask you to send me an email at albuddah@yahoo.com with the subject line “2014 Secret Santa” and you must include your mailing address. Also, so people can see that you are part of it, add your name to the posting in the Facebook group as well as below in the comments. We are getting going very late with this, so my apologies, so please get back to me by noon Saturday November 29, and I will get you the Secret Santa information soon after once I randomly assign people. How does it work? Well, I, with assistance from my little helper, will randomly assign people to a Secret Santa, and you will receive an email, (hopefully next Sunday) with the person you are to get a gift for. The gift must be $25 or more(not including shipping and handling), with the more being whatever your little heart desires. I have learned that some people wish to give more, and there is nothing you can do to stop them from doing so. Times are tough for everyone, so if $25 is a bit too high, I am sorry if this will exclude you from this festive display. Nonetheless, happy holidays to everyone!